Martin P. Kaiser was born on August 7, 1928 in Chicago to Martin and Mary (nee Heiberger) Kaiser. 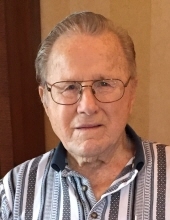 He died Thursday, October 11, 2018 in Arlington Heights. Martin is survived by his loving spouse of 63 years, Dolores Ellyn (nee Cilona) and his children, Martin D. Kaiser, JeanMarie (Scott) Brownson, Patricia (Tim) Doyle, Roberta (late David) Hansen, son-in-law to be Roy Schoenneman, and Kenneth (Annemarie) Kaiser. He cherished his grandchildren dearly: Martin G. and Heidi Kaiser, Claire Ellyn Lyons (Zac), Glen Brownson, Eleanor, Joseph and Henry Doyle, Erika Heller (John), Natasha Hansen, Benjamin and Samuel Kaiser. Dear brother to John Kaiser (Suzanne Checchia) and Frank Kaiser (Laura). Marty was part of a large, loving family that includes many cousins, nieces and nephews. He was preceded in death by his parents and siblings, Jacob Kaiser, Catherine Keehn (George), Mary Fichter (Frank), Paul Kaiser (Kathleen), Micki Handrick (Vern). Marty was a member of St. Edna Catholic Church in Arlington Heights. Early in his career, he was a journeyman and bricklayer in the Chicago suburbs, worked as a clerk for Chicago & Northwestern Railroads and held various machine shop jobs. From 1964 to 1990, Marty was a graphic artist and manager for Chartmasters in Chicago. Martin loved to travel and was proud to have visited all 50 states. He was happiest when fly fishing with his sons, brother and nephews and remodeling his homes. His basement workshop was a favorite place. He loved to grill and make the family sausage with his brothers and their children. He enjoyed photography and created 40,000 slides of family, friends and his travels. He always made time for his family, especially his beloved grandchildren. Marty lived a long, blessed life and was loved by all. Visitation Monday, October 15, 2018 from 3:00 pm until 9:00 pm at Glueckert Funeral Home Ltd., 1520 North Arlington Heights Road (4 blocks south of Palatine Road), Arlington Heights, IL 60004. Visitation 9: 00 am Tuesday, October 16, 2018 at St. Edna Catholic Church, 2525 N. Arlington Heights Rd., Arlington Heights, IL 60004 until the 10:00 am Funeral Mass. Interment will be at Maryhill Cemetery in Niles. In lieu of flowers, please consider memorials to Clearbrook 1835 W. Central Rd., Arlington Heights, IL 60005. Funeral Information and condolences can be given at www.GlueckertFuneralHome.com or (847) 253-0168. "Email Address" would like to share the life celebration of Martin P. Kaiser. Click on the "link" to go to share a favorite memory or leave a condolence message for the family.